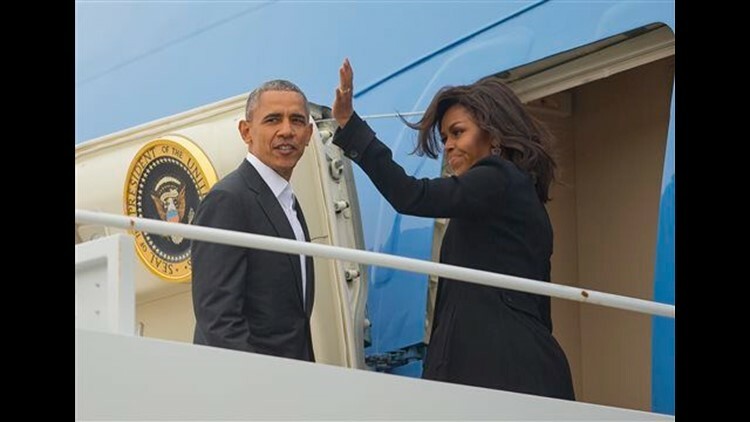 HAVANA (AP) — Stepping into history, President Barack Obama opened an extraordinary visit to Cuba on Sunday, eager to push decades of acrimony deeper into the past and forge irreversible ties with America's former adversary. "This is a historic visit and a historic opportunity," Obama said as he greeted staff of the new U.S. Embassy in Havana. Air Force One touched down on a rainy, overcast day in the Cuban capital. The president was joined by wife Michelle Obama and daughters Malia and Sasha. Obama was greeted by top Cuban officials — but not President Raul Castro. The Cuban leader frequently greets major world figures upon their arrival at Jose Marti International Airport, but was absent on the tarmac. Instead, he planned to greet Obama on Monday at the Palace of the Revolution. Obama's whirlwind trip is a crowning moment in his and Castro's ambitious effort to restore normal relations between their countries. While deep differences persist, the economic and political relationship has changed rapidly in the 15 months since the leaders vowed a new beginning. After greeting embassy staff, Obama and his family toured Old Havana by foot, despite a heavy downpour. They walked gingerly on the slippery wet stones in the square in front of the Havana Cathedral. A few hundred people gathered in the square erupted in applause and shouted Obama's name as the first family stepped forward. The Obamas then dined at a privately-owned restaurant in a bustling, working class neighborhood. Jubilant crowds surged toward the president's heavily fortified motorcade as it inched through the San Cristobal restaurant. For more than 50 years, Cuba was an unimaginable destination for a U.S. president, as well as most American citizens. The U.S. severed diplomatic relations with Cuba in 1961 after Fidel Castro's revolution sparked fears of communism spreading to the Western Hemisphere. Domestic politics in both countries contributed to the continued estrangement well after the Cold War ended. "He wanted to come to Cuba with all his heart," 79-year-old Odilia Collazo said in Spanish as she watched Obama's arrival live on state television. "Let God will that this is good for all Cubans. It seems to me that Obama wants to do something good before he leaves." Ahead of Obama's arrival, counter-protesters and police broke up an anti-government demonstration by the Ladies in White group, whose members were taken into custody by female police officers in a scene that plays out in Havana each Sunday. They're typically detained briefly and then released. Obama's visit was highly anticipated in Cuba, where workers furiously cleaned up the streets in Old Havana and gave buildings a fresh coat of paint ahead of his arrival. American flags were raised alongside the Cuban colors in parts of the capital, an improbable image for those who have lived through a half-century of bitterness between the two countries. Many Cubans stayed home in order to avoid extensive closures of main boulevards. The city's seaside Malecon promenade was largely deserted Sunday morning except for a few cars, joggers, fishermen and pelicans. The president's schedule in Cuba is jam-packed, including an event with U.S. and Cuban entrepreneurs. But much of Obama's visit was about appealing directly to the Cuban people and celebrating the island's vibrant culture. "I don't think that the Cuban people are going to be bewitched by North American culture," Gustavo Machin, Cuba's deputy director of U.S. affairs, told The Associated Press. "We don't fear ties with the United States." A highlight of Obama's visit comes Tuesday when he joins Castro and a crowd of baseball-crazed Cubans for a game between the beloved national team and Major League Baseball's Tampa Bay Rays. The president also planned a speech at the Grand Theater of Havana laying out his vision for greater freedoms and more economic opportunity in Cuba. Two years after taking power in 2008, Castro launched economic and social reforms that appear slow-moving to many Cubans and foreigners, but are lasting and widespread within Cuban society. The changes have allowed hundreds of thousands of people to work in the private sector and have relaxed limits on cellphones, Internet and Cubans' comfort with discussing their country's problems in public, for example. Obama will spend some time talking with Cuban dissidents. The White House said such a meeting was a prerequisite for the visit. But there were no expectations that he would leave Cuba with significant pledges from the government to address Washington's human rights concerns. A major focus for Obama was pushing his Cuba policy to the point it will be all but impossible for the next president to reverse it. That includes highlighting new business deals by American companies, including hotel chains Starwood and Marriott and online lodging service Airbnb.